Have you seen or heard about the new show “Tidying Up with Marie Kondo” on Netflix? For those of us fortunate to have a safe home in WNY, watching TV shows may not seem like a privilege. We often become connected with individuals in reality shows, with people of whom we’ve never met. Shows like Tidying Up, uplift viewers by showing how a little organization, gratefulness, and mindfulness can really make a difference in people’s lives. This isn’t much different than what we try to do for Hearts for the Homeless. We aim to demonstrate some of these same characteristics, help to educate and inspire those in need, as well as show others they can connect and help someone they may never meet. If you haven’t seen the show, it focuses around Marie Kondo, a Japanese professional “Tidier.” She’s renowned internationally for her tidying philosophy, having written several popular and well received books. After reaching celebrity status in Japan, upon arrival in the US, people raved about her “zen nanny” quirky methodology of organization. There are many great lessons to be learned within Marie’s “Konmari” method of tidying, you’ll have to see the show to learn more, but we wanted to focus on one aspect in particular. Over time, clothing stacks up. Fashion changes. Kids grow up. We change sizes. Everyone knows there are a few items of clothing in our closet that we just may not need. We hang onto these things for a time, and they build up, and eventually we have too much. Not everyone has this issue. Some people have very little. Some people have nothing at all. One part of the KonMari method of tidying is taking time to experience each and every item of clothing you have. Marie recommends holding the item, thinking, and feeling whether or not this item brings you joy. No matter the item, or it’s condition. If it brings you internal joy, keep it. If it does not, thank the clothing, and let it go. An interesting concept, but a lot of people are talking about it having positive results! 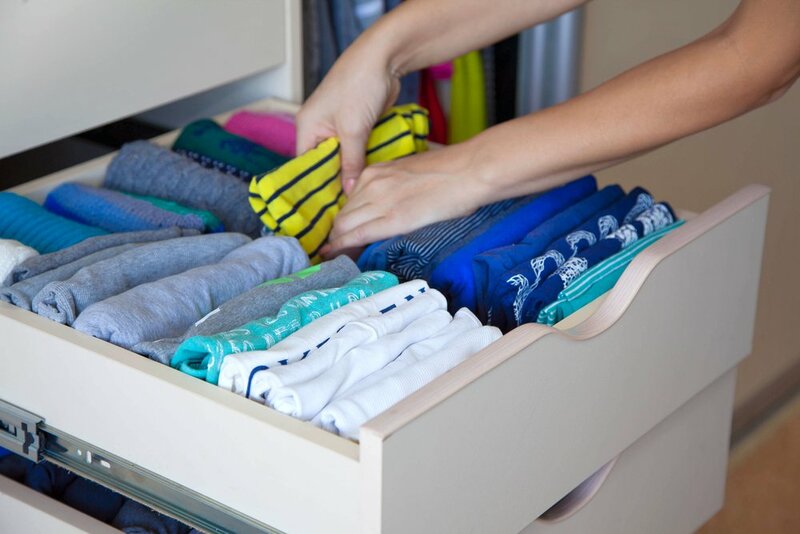 The show does a great job of showing how to tidy your home, but what are you going to do with all those old clothes? What the TV show doesn’t talk about, is how beneficial those old clothes can be to those in need. Donating clothing to the homeless has never been easier! You can simply drop off any old clothing in one of our red donation bins, anywhere in Western New York! Those of us fortunate to have more than we need probably don’t spend much time thinking about what a WNY clothing donation can do. This is something that Hearts for the Homeless wants to help demonstrate. Your clothing donation helps fuel the entire organization. We provide clothing, blankets, socks, hats, gloves, and much more for the homeless of WNY. Some of the clothing we resell to provide more resources for our Mobile Soup Kitchen, keep our Thrift Store tidy and clean, and help build big ideas like our future Buffalo NY Food Pantry! The next time you do some tidying up, watch the show, or hear someone talking about the show, remember to think of Hearts for the Homeless! Any clothes that may be given up and thanked by someone organizing their home, can provide an immense amount of joy and hope for someone who has little to nothing. When you drop off clothing in a donation bin around WNY, you’re providing more than just clothing.